An exhibition, premised on the view that gender limited the careers of these four artists, hopes to raise their profiles. Why devote an exhibition to "women" modernists? For centuries, female artists have fought to be taken seriously as just "artists," without any modifier that could be seen as limiting. "O'Keeffe, Stettheimer, Torr, Zorach: Women Modernists in New York," organized by the Norton Museum of Art in West Palm Beach, Fla., and now on view at the Portland Museum of Art in Maine, is premised on the view that gender limited the careers of these four—deemed "some of the most significant modernists in American history"—and attempts to provide the exposure that might lift them into the Western art canon. The show presents about 60 works, dated 1910 through 1935, when the rise of modernism gave artists license to experiment with new styles and vocabularies. Florine Stettheimer (1871-1944), Helen Torr (1886-1967), Marguerite Zorach (1887-1968) and Georgia O'Keeffe (1887-1986) knew one another, lived for a time in the same city, had overlapping careers and faced many of the same obstacles as other women of their day. But the exhibition doesn't quite work as advertised or intended. The talents and personal situations of the four vary vastly, and that affected their reputations as much as the prejudices held against them. And all difficulties aside, O'Keeffe is today a household name, while Stettheimer's reputation has been rising ever since her 1995 retrospective at the Whitney Museum. The other two are known mainly within the art world, partly because of their own choices. So showing these four together doesn't illuminate much about art history. At the Norton, after an introductory gallery, each artist was showcased in her own gallery, providing little incentive for viewers to compare and contrast. Portland, working in a different space, reshuffled the works thematically—juxtaposing domestic scenes by all four, floral scenes, landscapes and the like to show the many faces of modernism—but that didn't help. O'Keeffe and Torr explored similar ground, but it was Torr's brilliant husband, Arthur Dove, who maintained a dialogue with O'Keeffe that led to their imaginative, lyrical strain of modernism. Ellen E. Roberts, the Norton curator who originated the exhibition, sees Torr as a partner in that exchange—but there is little documentation to back her up. Meanwhile, Stettheimer forged her own, very idiosyncratic style, and the talented Zorach seems more in sync with French colleagues. Zorach, having moved to Paris in 1908, when Fauvism was all the rage, was among the first Americans to experiment with its bold colors and forms. Here "Les Baux" (1910) captures the drama of a landscape rather than its precise features. In "Untitled" (c. 1913) she turns abstract circles, diagonal rays and tree trunks into an enchanted forest. 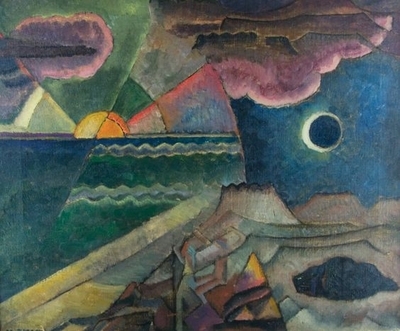 "Provincetown, Sunrise and Moonset" (1916) is a resplendent mix of Expressionism, Cubism and Futurism. She also painted daring nudes and flat, patterned figurative works. But Zorach had not devised a singular style when, two years after paintings by her in the 1913 Armory Show were noted for their "extreme modernity," she started a family. With little time to paint—and putting the career of her artist husband, William, first—she turned to embroidery and other textile arts. They are worthy and, this exhibition declares, a contribution to modernism. But they are still mostly viewed by art historians as women's art. What Zorach might have accomplished, had she not curtailed her painting, is unknowable, making it hard to accept the exhibition's bullish claim for her. Torr might not have had a career at all were it not for Dove, who worked side by side with her on their houseboat and boosted her confidence. 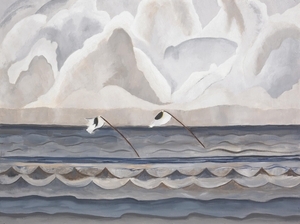 Their work—meditations on the natural world—is similar, though Torr is a bit more figurative than her husband, as seen in "Oyster Stakes" (1930), which shows two markers in a sea whose waves mimic the clouds. If only she had created more works like "Purple and Green Leaves" (1927), an oil abstraction painted on copper that shimmers with luminosity. Stettheimer is the most eccentric of this group. Independently wealthy, she never married but still resented the social obligations that stole time from her painting. Her humorous, flowing style played with perspective, mixed bright colors with unexpected pastels, and sometimes referred to other artists. 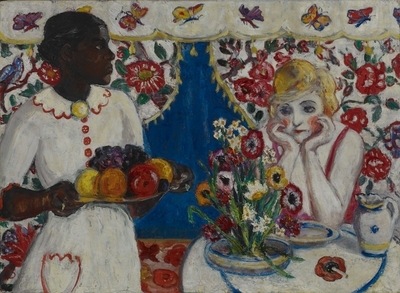 "Jenny and Genevieve" (c. 1915) portrays a bored woman moping at a table and attended by a black maid—a nod to Manet's "Olympia" set in a decorative background worthy of Matisse. She is most appreciated for her witty narratives, like "Picnic at Bedford Hills" (1918), which depicts her and her sisters sprawling on a yellow lawn—parasols askew—attended by Marcel Duchamp and the sculptor Elie Nadelman. In "Spring Sale at Bendel's" (1921), she satirizes upper-middle-class shoppers, who vie for bargains, practically leaping over one another. Always, her details—a fat chicken, the veiled hats—are delicious. O'Keeffe's works offer the fewest revelations—just a well-chosen array of flower, cityscape, landscape and skull paintings, plus a charcoal drawing, "Special No. 39" (1919), that was among those prompting Alfred Stieglitz, later her husband, to say "Finally a woman on paper." As the most important modern dealer of his day, he gave her entrée to the art world. Yet it's worth noting that O'Keeffe, who has secured a place in art history, most clearly fought back against the gender stereotypes imposed on her by art critics. She freed herself to concentrate on art by moving to New Mexico, away from them. Stettheimer held herself back, hesitating to exhibit her work, and until recently paid a price for that reticence. This exhibition will reinforce her rise. Zorach and Torr, both products of their era, seem likely to remain minor figures in the canon, even after this new exposure. Despite the array of interesting, even fascinating, paintings here, the history of American modernism remains unchanged.